Six of Gillingham's seven new signings featured in the club's opening pre-season friendly at Ashford United. One of them, midfielder Lewis Montrose scored the second goal in a 3-0 win over the Kent Invicta League side. Luke Rooney and Dennis Oli were also on target as the Gills played a different 11 in each half. 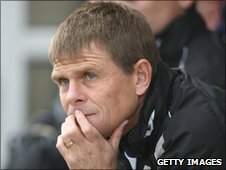 "It was a good 45 minutes each but it was nothing other than a training session for the boys," Gills boss Andy Hessenthaler told BBC Radio Kent. "We've done no work on team shape or personnel. The pitch was decent, we got enough out of it, that's the key." The game was the first of 14 pre-season friendlies and was played in front of more than 1,000 spectators at Homelands. Goalkeeper Ross Flitney, defender Matt Fish and midfielder Montrose played the first 45 minutes while striker Danny Kedwell and midfielders Charlie Lee and Chris Whelpdale all came on at half-time. The only downside was a late injury to Lee but the club say the knock is of no concern and he walked unaided from the pitch. The game also marked the return to football for Ashford, who will go under the name of Ashford United in the new Kent Invicta League, 12 months after the demise of Ryman League side Ashford Town. Ashford assistant manager Mark Patterson said: "The main thing about tonight was at last we have got a team back in the town. Thankfully we have a team playing again and the people of Ashford and Kent have turned out to watch it tonight so we are very, very pleased."